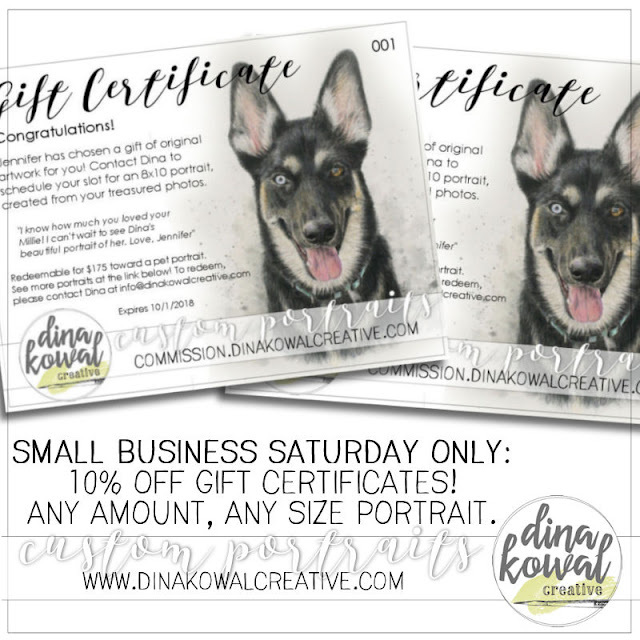 Dina Kowal Creative: More specials for you! I could never run my business without your support, so thank you from the bottom of my heart! Here are my gifts to you for this season of giving (and sales)! 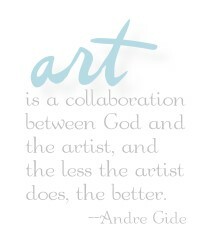 My portrait business has been the biggest blessing and surprise of this year! I know some of you are still waiting for your orders, and I'm thankful for your patience - I can see growth in my work as I go, so I'll assure you that the wait will be worth it, and I haven't forgotten you! Right now I'm working on Christmas orders and time is getting short. 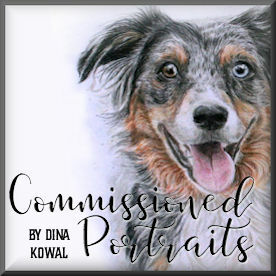 If you'd like to gift a portrait but you don't have the best photos, or there isn't time before Christmas, consider giving a gift certificate! They will be custom designed with any person, size, amount, or date in mind, and can be mailed or emailed to you or the recipient. If you order on Nov. 25th, Small Business Saturday, you will receive 10% off your order. No code needed! Find information on Gift Certificates here! 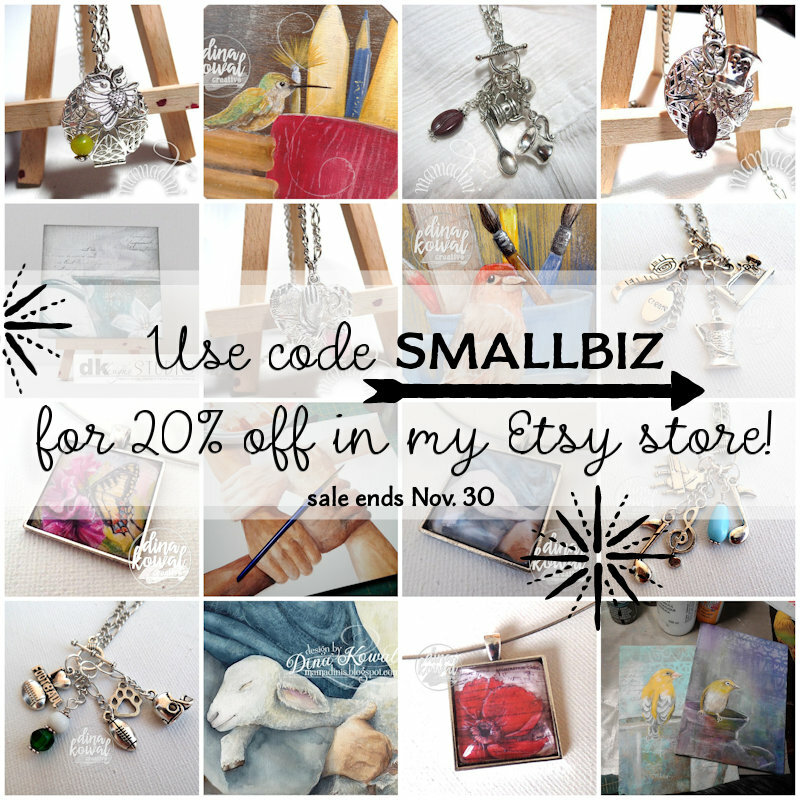 My Etsy store is full, and I'd like to offer you a 20% discount on anything you find there through the end of the month. 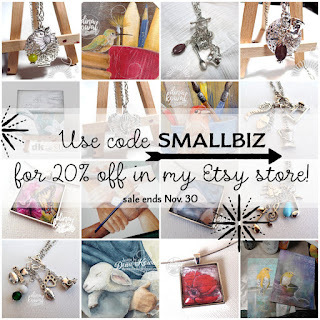 Please use code SMALLBIZ at checkout to receive the discount. If you have an idea for a custom pendant, please email me! I also have four TWO medium priority rate boxes full of new or very gently used items that are ready for a new home - each box is different but all contain the same types of items - patterned paper, stamps, stencils, dies, embossing folders, beads, matboard squares, punches, coloring mediums, inks, handmade items, ribbon, tags, alterable items, Flower Soft, and more. Each box is $50, which includes priority shipping. Please email me if you're interested in one of those!